The Global Terrorism Index (GTI) is an attempt to systematically rank the nations of the world according to terrorist activity. The index combines a number of factors associated with terrorist attacks to build an explicit picture of the impact of terrorism over a 10-year period, illustrating trends, and providing a data series for analysis by researchers and policymakers. It is the product of Institute for Economics and Peace (IEP) and is based on data from the Global Terrorism Database (GTD) which is collected and collated by the National Consortium for the Study of Terrorism and Responses to Terrorism (START) at the University of Maryland. The GTD has codified over 125,000 cases of terrorism. 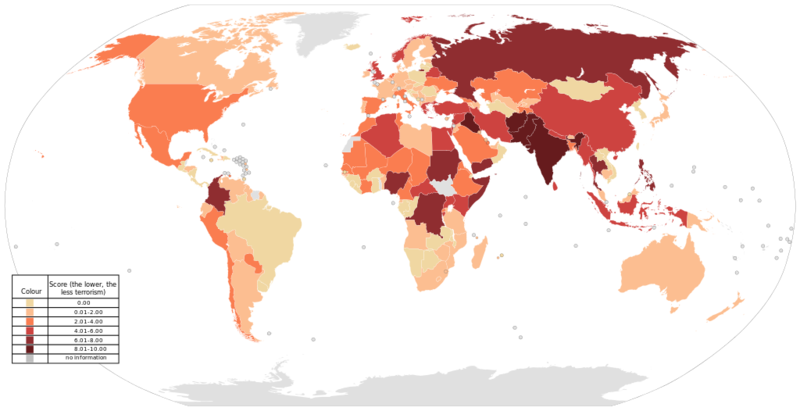 The 2014 Global Terrorism Index is the second edition of the index following a 2012 edition. An interactive map highlights changes to the level of terrorism and the Global Terrorism Index. Am 16. November 2015 wurde der Global Terrorism Index 2015 vorgestellt.